I just want to let that sink in for a while. If you haven't been following the long wait for Fallout 4 - let me just tell you - there have been a LOT of rumors and false leads and faked leaks and tons of times that Fallout fans have been mislead into getting their hopes up, and then... nothing. But now, Fallout 4 has been confirmed. You can preorder it today. No release date has been announced - not even a vague hint as wide open as a year. But it is obviously coming. Let's get into the video a bit. There is a lot to digest. First, the most obvious change is the look at pre-war life. Previous titles in the series have shown us television footage from before the war, and even a couple of Virtual Reality trips into the simulated past -- but this is the first time they have shown actual pre-war life as a part of the game. Now, it could have been just for this video --- it could be just an intro cut scene, or some sort of visualized flashback, I'm not sure. But it really did look like something in game engine (and I'll talk more about the engine shortly) and something that they put a lot of effort into - so I doubt they will waste it just on a teaser trailer. There are several theories as to how the player could interact with pre-war life. Some think it may be a tutorial level - the very beginning of the game. Having to perform some menial tasks, getting used to the controls, until you hear the broadcast from the trailer, and then you have a short amount of time to get yourself - and maybe your family - to the Vault - Vault 111, to be precise. That could be cool, and that is something I've heard fans ask for in the past. Coupled with that theory is that you - the player - will actually be a descendant of the family you play in the beginning. Some have even suggested that you will be the same person - and that this particular vault's "test" will involve cryogenics, so you will not have aged the decades, or even centuries between the war and the post-war world the bulk of the game is set in. Others have suggested that this game will be set much *earlier* in the timeline than the other Fallouts. In the fictional alternative history of the Fallout universe, the "Great War" (the bombs from the trailer were the beginning, middle, and end of the Great War, which took only 2 hours) takes place in the year 2077, (October 23, 2077 to be more precise). The first Fallout game was set 84 years later, in 2161. The next game to take place was Fallout Tactics in 2197, then Fallout: Brotherhood of Steel in 2208, then Fallout 2 in 2241... And then we get to the last two games, the ones most people know about - Fallout 3 and Fallout New Vegas. The main quest of Fallout 3 takes place in the year 2277 -- 200 years after the bombs fell, (the prolog, which includes the player's birth, starts in 2258). Fallout New Vegas starts in 2281. That's the order the games take place in the fiction of the lore -- that is not the order they were released. So it is possible that Fallout 4 could take place at any time after the Great War - perhaps even before the events of the first Fallout - but I personally doubt it. More on that in the next section. Where I believe the Pre-War game play (if there is any) will come in is hinted at in one shot of the trailer. The rainy shot of what people are calling the "Mysterious Stranger" in Scollay Square. The name of the place under the Scollay Square sign is "Memory Den". I believe this will be the place - or one of the places - offering virtual trips back in time to before the war. Either through stored memories -- perhaps from Ghouls (who can live hundreds of years --- many of which actually being pre-war humans turned into Ghouls by the bombs), or perhaps from your own past, if the character did undergo some sort of suspended animation. Or there could be some other explanation of where the memories come from. But I think this is how we will get to play pre-war scenes in Fallout 4. The reason that people believe it is set earlier in the timeline is because of how "well preserved" everything appears. And, yes, compared to other places we've seen in the Fallout universe - especially in the last 2 games - Boston does appear in much better shape. But not, in my opinion, because of the lack of passage of time. But because they were not hit as hard as the Capital Wasteland or West Coast were. The Capital was hit hard because - well - it was the capital of the United States. If you want to take out another country, you need to attack its capital. The West Coast would have been hit harder because it was closer to China - which was America's enemy in the fictional Great War. Boston is pretty far from China, and isn't much of a strategic target. So it would not have been hit as hard as the locations from the last two games. Another reason it is in better shape is because it has been rebuilt. One of the things that has always bothered me about the franchise is that the bombs dropped decades or even centuries ago, and yet most of the places look like they haven't been touched since that day. Granted - some of the places wouldn't have been touched - but even the living quarters of most of the non-vaultdwellers look like they haven't been cleaned since the war knocked everything over. Fallout 4 shows what could happen if people, you know, actually remembered what a broom was for. (There sure are enough brooms in the Fallout series that *someone* should be cleaning with them!) This is a *living* city - not the ruins of a dead one. There is life here, and that life wants to put the war behind them and get on with life. You know - like we do in the real world. Have you been to a living city where war or terrorism or a natural disaster destroyed part or all of it? Did that even take place more than 10 years ago? Does it look like Fallout 3 - or does it look like life goes on? Personal side note - I went to Ground Zero in New York City less than a year after 9/11 - and, yes, there was still damage. But people were working to repair and rebuild. Now, the new World Trade Center is standing tall in that place. Because humanity moves forward, rebuilds, and life goes on. The same could be said of New Orleans or the Pentagon, or -- more directly related to the Fallout series - Hiroshima, Japan. That city is alive and well today. And it hasn't been 200 years, or even 100. Boston in Fallout 4 represents a rebuilt city. And part of the reason for that - I believe - is the Institute. The Institute has been referred to many times in the Fallout series. It is a place, on the East Coast, of advanced Technology. The belief among many (and I'm not sure if this was ever fully confirmed in the Lore or not) is that it is MIT - the Massachusetts Institute of Technology. And I further believe it is the very tall building seen in many of the shots of the trailer. The Institute would give Boston a lot more tools to work with to rebuild - and it would give people a reason to move to Boston, and therefore more people to rebuild. Another theory for the preservation of the city is somewhat opposite to an earlier theory. Instead of being closer to the Great War - and being earlier in the timeline -- it could actually be much *later* in the timeline, and further from the bombs. Thus giving the people more time and technology to rebuild. Especially if it does take place after the events of Fallout 3 - and (SPOILER ALERT) - the successful restoration of clean water through Project Purity. That would account for the much larger amounts of plant life seen in even the post-war scenes of the trailer. But one thing I do want to ask you about before I go - at the end of the trailer - what appears to be the player character appears, wearing an iconic vault jumpsuit (Vault 111), a PipBoy (with much more logical button placement! ), and carrying a cool looking gun. He pats the dog on the head and says (vocally) "Let's go, Pal!" This suggests the player character will be voiced. What do you think about this? Do you like the idea of the game having a definite story about a definite pre-made character that you just control? Or do you prefer the silent protagonist of all the previous Fallout titles? Share your thoughts on this - and on all things Fallout - in the comments below. PAC-Man is 35 years old today. This early-age video game icon has been gobbling up dots for more than 1/3 of a century. Spawning dozens of official sequels and spin-off titles -- and hundreds of clones, copy-cats, and unofficial games -- PAC-Man has left his mark not just in the video game world, but throughout media. "PAC-Man Fever" was one of the first --- if not the first video-game inspired songs to ever be published, and it was a chart-topping hit. Pac-Man has had multiple TV shows, has appeared in multiple movies, has had toys, clothing lines, cereals, lunch boxes, board games.... You name it - there's a Pac-Man version of it. From arcades, to consoles, to smartphones, to PCs --- pretty much if there's a digital device out there capable of receiving up-down-left-right input - PAC-Man has been ported to it (officially or not). PAC-Man once even took over Google. On this 35th Anniversary, let's look back at some of the world-record breaking milestones that PAC-Man and the whole PAC-Family have been a part of, according to Guinness World Records. Before the Mario Bros came along in 1983, PAC-Man had already established the first video game family. Following the breakout success of the original PAC-Man arcade game, American licensee Bally Midway released a series of unofficial spin-off games. Ms PAC-Man (released January 13, 1982) proved so successful that Namco eventually adopted it as an official release, but the same cannot be said of Baby PAC-Man (1982) and Jr. PAC-Man (October 1983), which, along with Professor PAC-Man (1983), contributed to Namco eventually severing ties with Bally Midway. According to creator Toru Iwatani (Japan), PAC-Man (Namco, 1980) was designed to appeal primarily to women. Two years later, the addition of a hair bow and lipstick to the munching mouth turned PAC-Man into Ms. PAC-Man (Bally/Midway, 1982), the first playable female character in any video game. From its launch in 1981 until 1987, a total of 293,822 PAC-Man arcade machines were built and installed in arcade venues around the world. Designed by Tohru Iwatani (Japan) of Namco, the original game took eight people 15 months to complete. Namco estimate that PAC-Man has been played more than ten billion times since its launch. In April 2009, renowned French prankster Rémi Gaillard uploaded a video of himself dressed in a full-size PAC-Man costume being chased by cohorts dressed as ghosts in a supermarket, golf course and other locations. The clip is the most viewed PAC-Man video on You Tube, with 45,831,671 views as of August 18, 2014. In 2004, students from New York University created PAC-Manhattan, a “real-life” re-enactment of the game in which people, dressed as PAC-Man and the four ghosts, chased each other around Manhattan city blocks. The playing field consisted of 6x4 city blocks surrounding Washington Square Park, with a total surface area of 171,029m². To celebrate the 30th anniversary of the game's release, Google released a PAC-Man-inspired Google Doodle, an interactive banner using the same graphics and game play as the original arcade version. Launched on May 21, 2010, it was available for 48 hours and visitors to Google.com played for nearly 500,000,000 hours. Based on the average officer worker's salary, it's estimated to have cost businesses around $122 million in lost productivity. Measured by its total number of pixels, the largest PAC-Man game is The World’s Biggest PAC-Man, with a total of 4,014,144,000 pixels across 62,721 mazes. The game, playable online at worldsbiggestpacman.com, went live on April 12, 2011 and was developed by Australia’s Soap Creative agency to celebrate 30 years since the original arcade release by Namco. As well as letting Facebook users play against each other, the game allows fans to design and share their own levels. Here is an unboxing of my new WinBook TW700 7" Windows 8.1 Tablet from MicroCenter. It cost me (and is still currently on sale as of the time of this writing) only $59.99 plus tax (normally $89.99). Don't let the "+ Bing" thing scare you. All it means is that the manufacturer got the OS for free from Microsoft with the guarentee that it would ship the product (in this case, the tablet) with the defaults for Internet Explorer all set to Bing and MSN. This is normally the case anyway on Windows 8 - but some companies make deals with Google or Yahoo to change those defaults. As the consumer, you are free to change all the settings you want. You are not locked into Bing. You never have to use it at all, and you are free to use Google, or Yahoo, or Ask, or Alta Vista... (is that even still a thing?) or whatever. So you are getting a full Windows experience. This is not WindowsRT, or even something like the Windows 7 Starter Edition. This is full Windows 8.1 - with all that entails, the good and the bad. So don't freak out about the + Bing. I do also want to point out that Windows 8 by itself sells on the Microsoft Store for $79.99. There is a folder and icon for Office 365 on the tablet, but it's not actually installed. Clicking that starts the installation process, and you have to input the code from the card that is included in the box with the tablet in order to authenticate your subscription to the service. I haven't installed it because I'm not sure I'm going to use it, and since it is a subscription and not a straight install-once-use-forever thing, I'd rather wait until I'm sure I need it before I activate it. The license is good for "1 Tablet + 1 PC/Mac" - but I don't think it has to be *this* tablet. I've only had it a couple of days, but I am certain I'm going to get my money's worth out of this one. Like I said, Office 365 alone is worth more than I paid - but even aside from that - I got a full brand-new Windows computer for less than $60! That's amazing. The full-sized USB is important to me. That gives it far more of a computer vibe and less of a tablet vibe. I mean, I know technically any tablet/phone/device with a USB-OTG port, regardless of size (full, micro, or mini) can have peripherals -- and I know BlueTooth peripherals exist. But the convenience of being able to just plug something directly into the side of this thing makes it feel a lot more like a PC to me. No adapters or limitations - just any other USB slot on any other computer I've used over the last 15 years. Easy Peasy. I've plugged keyboards, USB drives, etc. into the thing, and it just works. Sure - you have to install drivers for certain things, just like on any Windows computer - but there's nothing strange about the process just because it's a tablet. The device has a 16GB internal flash drive, but you only have access to 8GB of it, I'm not sure what's up with the other 8GB, but I assume it's something like a recovery drive or something, but it's not visible in Explorer. I didn't look before I started installing apps and software, but even after installing LibreOffice and a few other decent sized programs, I had over 2GB left. And it has a MicroSD slot, so I've got a 32GB card in there. That should hold me for a while. I am a Mac user, and I have Windows installed on a small partition of my MBP, but I rarely use it. This tablet will let me quickly and easily run lighter Windows-only apps. And with the full-sized USB I can do things like root my phone quickly and easily (which is not always simple on a Mac). I wouldn't recommend it as your main computer, but if you are chugging along on something that is 5 years old, or if you just want a second machine for the living room or something - this is far more functional than a phone or Android/iOS tablet, and it costs less, too. Today, Marvel had an event and announced their "Phase Three" films (basically in response to DC's films through 2020). April 5, 2019 - Shazam! Also, there are the upcoming Star Wars films, Episodes VII, VIII, & IX - and at least 2 other "Stand-alone" films in between those. There were two big events in the world of MicroConsoles this week. The first being that the Playstation TV launched in North America, and the second being the (surprise?) announcement of Google's Nexus Player. And, did I mention that the Playstation Vita only has 1GB of onboard storage - and the only way to add storage is through Sony's proprietary PS Vita Memory Card. Those are retailing for more than $1 per GB at the moment. Some cards almost $2 per GB, depending on size and store and sale. And you will need a card if you want to download anything. 1GB of storage will not cover much in the way of gaming. Heck, you'd be lucky to fit more than 1 PS-one classic on there. So.... for now, unless they change a LOT of the software limitation, and significantly lower the cost of their Vita Memory - I would have to strongly advise passing on a PS TV - as much as I wanted them to be cool. On the other hand, we have the Google Nexus Player. I mentioned in my last MicroConsole focused post that Google had bought a game controller company which made some speculate the big G would be entering the game console market. Well, they sort-of have now. In much the same way Amazon sort-of has with their Fire TV. The Google Nexus Player is more of a Android Box than MicroConsole - but it is FAR better than the now-defunct "Google TV" boxes of the past. Like the Fire TV, the Nexus Player is a MicroConsole style set-top-box with an optional game controller. However, it doesn't appear the game controller was made by the company that Google bought. It appears to be made by Asus. Also, it appears to be the exact same controller as the OnLive MicroConsole with the media buttons removed (which is supper odd, since they would actually have potential use here, as opposed to on the OnLive system, which had no media apps whatsoever) and rounded mid-face buttons. Seriously - Look at them! Look, I know I said the same thing for the Amazon Fire TV's controller - but this is right out the same controller. No moving of sticks and D-pads. The angles - the contours - the indicator lights - everything! It's the same stinking controller I tells ya! The Nexus Player seems like a far more solid system, offering the full Android 5.0 (Lollipop) experience and a far more powerful set of specs - including the ability to handle 1080p, which the PS TV lacks. I'm not saying you have to rush out and get either one (the Nexus Player isn't out yet, it was just announced today, with preorders coming latter this month). But I'm saying of all the MicroConsoles I've seen, the Nexus Player is the best, with the Amazon FireTV coming a close second. 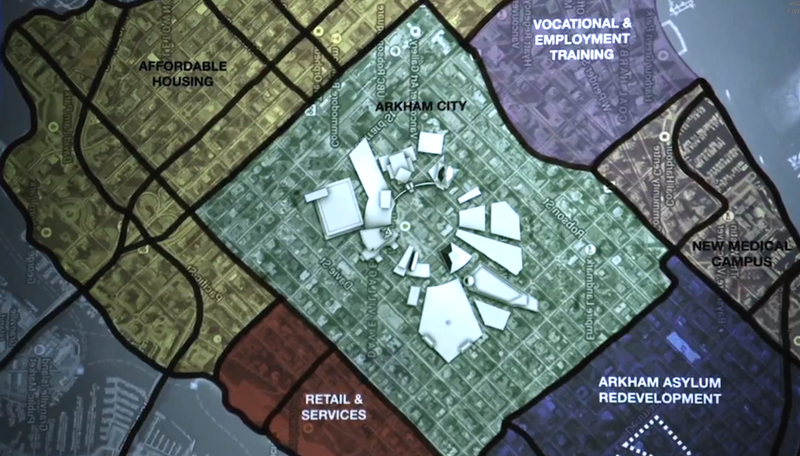 This map is from Fox's new "Gotham" TV series, shows the location of Arkham Asylum and the surrounding area, (a place they refer to as "Arkham City" - but it is an area within Gotham City itself). The map is actually a mirrored image of map of Vancouver, BC, Canada. Even the labels / street names are flipped. For those who might not yet have heard, Nintendo has announced a new handheld game system. As of now, it has only been announced for Japan, but there isn't much chance it will be exclusive for long. The new system is called "The New Nintendo 3DS". And the confusion is already clear. Let's clarify one thing. 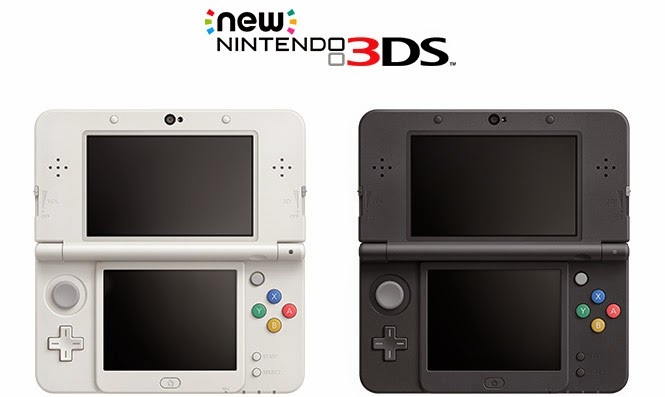 A lot of people online are calling this the "New 3DS" - that is not the name. 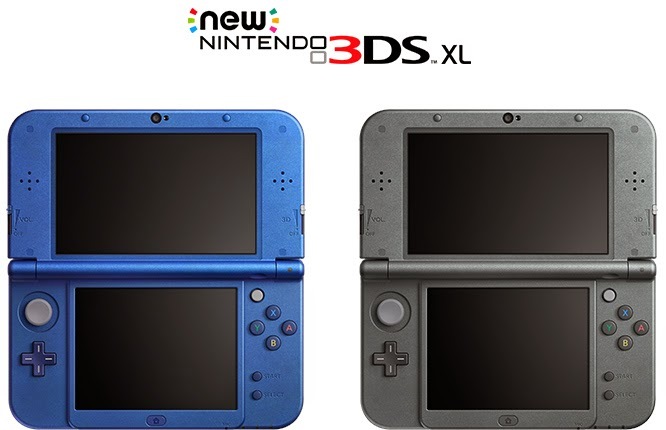 The name is the "New Nintendo 3DS" --- not the "Nintendo New 3DS", the New comes first. The first problem,"New" things don't stay "new" for long. Remember a few years ago - Apple came out with the "New iPad". That was the official title. Not the iPad 3 or the iPad 2012 or the iPad 3G or the iPad 3rd Generation... no, it was officially titled and marketed as "The New iPad". It was replaced and discontinued in less than 8 months. It took less than 2/3 of a year for the "New" iPad to go from "New" to "Not-the-Newest-One-Anymore" to "No Longer being made or sold". I'm not saying the "New Nintendo 3DS" (which I am now going to call the nn3DS because - it's faster) will be obsolete in 8 months. But what I am saying is that at some point in the future, it will no longer be the newest handheld console from Nintendo. And before that even happens, it will simply no longer be "new". The PS Vita is Sony's latest handheld - but it's not "new". It has been out for over 2.5 years and has already seen a hardware refresh. It is not "new" by most technological or video game standards. It is still the new-est - but it is not new. And the same will happen with the nn3DS. The second problem - probably the bigger problem - that name is confusing as *#^~@! I seriously hate the name. None of this would really matter much if - like the 2DS - the nn3DS only played 3DS games. But they don't. There will be exclusive titles to the nn3DS. Meaning you will run into all this confusion everytime you want to buy a new 3DS game... or a New 3DS game.... or a new-New.... $*#@)#*!#*!!! Now.... Name aside - what is so... *ahem* "new" about it? A second analog disc - much smaller than the main one. The 3DS already has an awkward optional add-on device that adds a second control disc. So it would be possible for nn3DS games to use that to be backwards compatible - but that is not all that separates the 2. The 3D is better. The 3D can now be seen from a much wider angle - and not just directly on. On the current 3DS, if you tilt either your head or the 3DS screen even slightly it can - and does - break the 3D effect and blurs the screen. The nn3DS promises to change that. This will be really helpful for anyone wanting to share their screen with someone else (which doesn't make a whole lot of sense on a handheld... but it is good to have the option). A feature a lot of reviewers aren't even mentioning is there will now be 2 shoulder buttons per side. This, with the new circle pad, will finally bring the 3DS to have the same number and type of controls that virtually all other consoles have had for the last 3 generations or so. The thing that will make nn3DS games impossible to run on the "old" 3DS is that the new hardware will have a faster, more powerful processor. It will also have NFC to communicate with Amiibos. (Something that yet another optional add-on accessory for the 3DS will be able to do.) Potentially, this could be used for Disney Infinity and Skylander figures as well, but I am far from familiar enough with the tech to know if that is even possible. It is moving from an SD slot to a Micro SD slot, which isn't horrible, but it is more limiting. At least it is an open standard format and not some proprietary garbage like Sony uses on the Vita. Some of the button layout is different, not just the addition of the new controls, but the star and select have been moved - and the XYAB buttons are now color-coded like the Super NES/Famicom buttons were. This is a nice touch. All-in-all I like the system just fine - but I hate the name. I look forward to seeing it in action.